Spring has definitely sprung early here in Georgia and Easter is only a few weeks away! So if you are a DIYer like me, that means it's time to start thinking about getting your craft on! I try not to go overboard and be too cutesy, but for me, it just wouldn't be spring without a few rascally rabbits scattered about! Sooo...I am sharing my ten favorite ways to add those iconic bunnies to your spring décor. Of course, it's the prime location for bunnies! Check out my WHIMSICAL EASTER MANTEL starring my natural fiber bunnies for a little rustic touch. Here's a chippy favorite...MY RUSTIC BOX DRESSED FOR EASTER! Add a few Easter eggs and carrots and you are good to go! My POTTERY BARN BUNNY GARLAND is fun and inexpensive to make and so easy that the kiddos could help! Here's my favorite spring wreath...my NO-SEW BUNNY AND CARROT WREATH. It was fun to make and I didn't have to pull out the sewing machine...always a plus! Here's another project for your front door...my POTTERY BARN INSPIRED BURLAP BUNNY BANNER! And...it was soooo inexpensive to make! Cute burlap bunny ears top these easy and inexpensive to make PIER 1 INSPIRED NAPKIN RINGS...the perfect addition to your spring table! Round up all of the silverware in these NO-SEW BUNNY EAR SILVERWARE POCKETS for a whimsical addition for your spring tablescape! What's more fun than a BUNNY EGG COZY? And they are not only inexpensive but require no sewing! As a fun Easter surprise for my little grands, I created these NO-SEW BUNNY TREAT BAGS and used them as a part of the centerpiece for my POTTERY BARN INSPIRED EASTER TABLESCAPE. Paint chip cards serve as fun Easter eggs tags. Here's another way to include bunnies in your decor that is a little more rustic...my BALLARD INSPIRED FRENCH BUNNY PILLOW. The free graphic is included in the tutorial. Hey, I know I said ten, but here's one more...my PEEPS MASON JAR CANDLES! You've gotta love them even if you don't eat them! 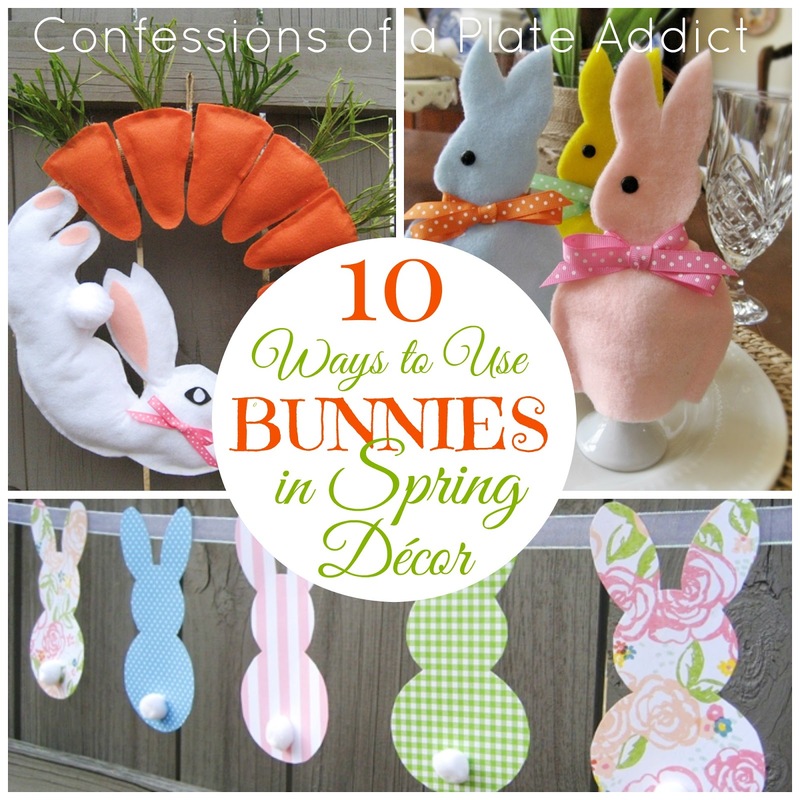 And I am working on a few more super-easy and inexpensive spring projects with bunnies, so stay tuned! Loved all the cheerful decorations. Your banners are inspiring. Love all the bunnies and thanks so much for the DIY instructions. I just love bunnies. I love the egg cozy's!!! I love all you beautiful bright ideas for using Easter bunnies! I didn't think to put a wreath on a mirror. It's has a beautiful effect and I plan on using your idea in my foyer. Everything you shared is inspiring, so thanks for sharing.